We meet Pippa Funnell this month as find out all about her Tilly's Pony Tails books! 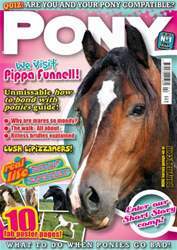 We also tell you how to bond with you pony, plus get up to scratch on laminitis. Also learn how to perfect your dressage walk and jump with no faults, only in April PONY Mag!